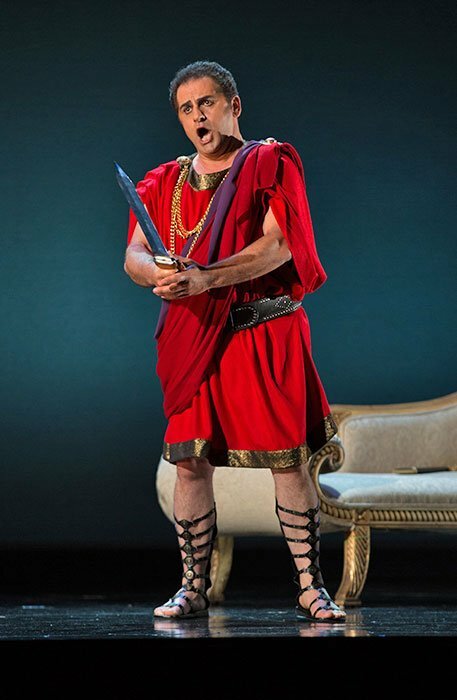 “When in Rome,” Odyssey Opera’s mini-festival of opera seria on Roman historical themes, brought us imaginatively conceived productions of two operatic rarities: Gluck’s Ezio, heard last week, and Mozart’s Lucio Silla, heard on June 8th. Repeats on Sunday at 3:00. After completing the text of Lucio Silla, the Milan theatre poet Giovanni de Gamerra sent it to Vienna for approval by his mentor Metastasio, who returned it with additions and changes. In October the libretto reached Salzburg, where Mozart began the overall planning of the scenes and the composition of secco (dialogue) recitatives. Arias and dramatic recitatives would have to wait until he met the lineup of singers in Milan. Father and son left Salzburg on October 24, 1772 and arrived in Milan on November 4th. In late November the primo uomo, the castrato Venanzio Rauzzini (for whom Mozart wrote the motet Exsultate, jubilate during January) arrived, and on Decmber 4th the prima donna, Anna Lucia de Amicis. Unfortunately, the tenor for the title role was ill, and a substitute arrived only nine days before the premiere. When he turned out to be fairly mediocre, Mozart, who had a keenly pragmatic sense of the talents of individual singers, reduced the number of arias for him from four to two. Still, the opera was on a grandiose scale, with three ballets. The premiere on December 26th was supposed to start at 6 pm and last until midnight; the curtain was delayed by two hours, however, because the Archduke was busy writing the obligatory New Year’s greetings to Maria Theresa. Despite these vicissitudes, the opera was a success, running in the Royal and Ducal Theatre for twenty-six consecutive performances. Opera fans should not be put off by the schematic nature of Lucio Silla’s plot, in which historical fact is combined with a fictional love story. A vindictive Roman tyrant (Lucio Silla, tenor), encouraged by his friend, the tribune Aufidio (tenor) holds the heroine (Giunia) captive, intending to make her his wife. She rejects him, swearing eternal fidelity to her beloved, the banished Roman senator Cecilio (soprano), who has secretly returned to Rome and plans to kill the emperor. The lovers are imprisoned and threatened with execution but, in a sudden change of heart, the emperor turns benevolent. He frees the prisoners, bestowing his blessing on their marriage; his sister Celia (soprano) will marry Cinna, Cecilio’s friend and co-conspirator (soprano). To everyone’s surprise, the reformed dictator renounces his throne, granting liberty to the Roman people. Lucio Silla follows the conventions of Metastasian opera seria, with its setting in the ancient world, dramatic confrontations between love and duty, and progression to a happy end. Recitatives advance the action; virtuosic arias allow each protagonist to display a single Affekt or emotional range, with the more important singers given a wider variety of expressive types. . Castrati were the highest paid singers until the mid-eighteenth century, when they were gradually replaced by prima donnas in trouser roles. No longer representing power and majesty, castrati were still used to signify youth; the two male lovers in Lucio Silla were both originally castrato parts. In Odyssey Opera’s production, Cecilio, as sung by counter-tenor Michael Maniaci, projected ringing tones across a wide range, and apparently effortless mastery both of Mozart’s written-out coloratura and of improvised ornamentation in da capo reprises. Soprano Joanna Mongiardo leapt nimbly about the stage in the trouser role of Cinna, the flexibility of her voice in the stratosphere matched by its clarity at the bottom of her range. The biggest voice was that of Katy Lindhart, in keeping with her heroic role as the steadfast and courageous Giunia. In her Act I aria, she shifted in a moment from the reverential tone displayed in her recitative exchange with Silla to heroic defiance in a bravura aria in which her powerful soprano was bolstered by oboes, horns, and trumpets. An occasional tendency to shriek on top notes had disappeared by the second act. Lighthearted and insouciant, Sarah Heaton’s pure and focused tone seemed to embody Celia’s cool intrigue as she tossed off flights of staccato coloratura. In the title role, Yeghishe Manucharyan’s powerful tenor and commanding presence conveyed the menacing force of a tyrant, yet in his opening aria hinted at the emotional conflict between vengeful fury and the pangs of unrequited love. As the soldier Aufidio, tenor Omar Najmi shone in adroitly delivered recitatives and in his warlike Act II aria that urged the tyrant to assert his will. Although long, these arias were never tedious. All the singers introduced variants that shone new light on da capo repetitions. Under Gil Rose’s skillful direction, tempos remained unhurried, allowing the singers time for forward-moving yet unhurried delivery of intricate passage work that was breathtakingly expressive rather than merely virtuosic. Alongside Metastasian conventions, an awareness of newer tendencies in musical drama on the part of both Mozart and his librettist was demonstrated by several scenes in which disparate elements of secco and accompanied recitative, aria, and chorus followed one another seamlessly. One of the most effective took place at the end of Act I. Giunia and her attendants gathered in the cemetery to invoke the spirits of the departed, a typically Romantic scene of darkness and the supernatural. Cecilio is already there, and contemplates the dead in a wonderfully atmospheric soliloquy richly accompanied by oboes, horns, trumpets and strings,with divided violas and bassoons. His thoughts are punctuated by orchestral outbursts and articulated by several tempo changes. Intense commentary by the chorus is interrupted by Giunia’s chromatically-tinged lament, followed by another accompanied recitative for Giunia at the end of which Cecilio reveals himself. The act concludes with the lovers joining in an impassioned duet. Act II featured an aria in the heroic mode for Cecilio with oboes, horns, and trumpets and a corresponding aria for Giunia with the same orchestration; each aria was introduced by an intensely chromatic accompanied recitative. Here Lindhart outdid herself, in command of her full range as she tossed off extended roulades. Celia’s lighthearted attempt to woo Cinna in an aria accompanied by a pair of flutes in addition to strings was a charming interlude in pastoral style between these displays of vocal fireworks. In a more somber mood, Maniaci gave us an affecting rendition of Cecilio’s Adagio expressing acceptance of his impending fate. The highlight of Act III was Cecilio’s farewell to Giunia, set in restrained style as a minuet, the dance associated with the nobility and thus with a noble and generous spirit. Before he was killed, he would die of love for Giunia’s eyes (“pupille amate”). Close to madness in her anguish, Giunia believes she has lost him. Her final aria was accompanied by an unusual ensemble of flutes, trumpets, divided violas, muted violins, with an independent bassoon part. The melancholy Andante of the first stanza was followed by an agitated Allegro, and there was no da capo return. The final scene took place in the palace in the presence of all the protagonists. Although the happy ending may have seemed contrived, it was the logical conclusion to the bravery and steadfastness of the lovers, and even to the dual nature of Silla, whose “soft spot” was revealed, if only to himself and us, early on. With limited resources, Odyssey Opera wisely concentrated on assembling a stellar cast and an ensemble of top-notch players. Sets, by Jian Jung, were minimal: a tree or a pillar here, a curtain there, some Louis XV seating as needed. Effective lighting by Jeanette Oi-Suk Yew did the rest. Seth Bodie’s costumes evoked Roman tunics and draperies in strong, sometimes garish colors. Isabel Milenski’s stage direction was straightforward and unstylized, allowing the singers to move freely and avoiding exaggerated poses. The informative historical notes by Teresa Neff were a welcome addition to the program book. Congratulations to Gil Rose for bringing us such a well-coordinated production of this absorbing and by no means outdated drama. Remarkable singing of pure emotion with commanding stage presence and virtuoso conductor of captivating musicians left me in a state of ecstatic awe. One thing that needs to be mentioned is artistry of the stage lighting which created a depth of feeling beyond the ordinary. It was masterful in making the opera be on a much grander scale of beauty. I cant say enough about her delicacy of feeling with light. Im just a lucky guy to witness such endearing beauty twice in a week.